Currently in the UK the vast majority of people are on fixed electricity meters – devices* which simply measure how much electricity has been used. These are used by the supplier to calculate how much you owe them for the electricity you have consumed – e.g. 11 pence per kWh (unit) – during a certain period of time. * One exception is the Economy 7 tariff which offers cheaper electricity between 1.00 am and 8.00 and uses a different type of electricity meter. During the day there are peak times when many people are using a lot of electricity – for example, in the early evening when many lights, tv’s, and computers are switched on, and ovens and kettles are being used to prepare meals. In the middle of the night demands drops right off. Therefore wholesale electricity prices fluctuate widely during every 24 hour period. Currently utility companies sell electricity at below cost during peak times, and at a large profit during other times in order that they make an overall profit. A smart meter offers two way communication between the utility company (electricity supplier) and the consumer. When demand is high (and therefore wholesale electricity prices are very expensive) the utility company can pass high costs onto the consumer. When demand is low (and therefore wholesale electricity prices are very cheap) the utility company can pass savings to the consumer. This motivates consumers to use electricity when demand is least so that they can save money. The use of smart meters will reduce overall carbon emissions (since thinking about electricity usage tends to make people reduce their overall consumption), and also reduce electricity bills for anyone who makes the effort to time their electricity usage – for example, running the washing machine or tumble drier at night rather than during the day, and turning the dish washer on just before going to bed rather than immediately after eating. Smart meters are likely to cost over £100 with those costs passed to the consumer either directly (fixed installation fee), or indirectly (increased electricity prices). With smart meter technology it will eventually be possible for consumers to view their electricity usage online by hour, day, week, and month on their utility company’s website. 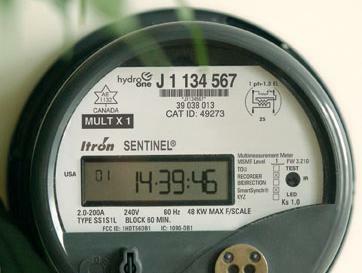 Canada has been at the forefront of smart meter initiatives with plans in many regions to have all homes and businesses equipped with smart meters by the end of 2010 – that’s 4.5 million smart meters planned for Ontario alone. Without smart metering Ontario would be unable to guarantee that electricity demand could be met at peak times with the risk of power outages similar to those which occur in California, USA. By shifting appliance usage (as shown in the diagram above) to later in the evening/night, peak usage can be greatly reduced. In Ontario they have used a simple system of three price bands: on-peak, mid-peak, and off-peak. As of May 1st 2008, off-peak usage is charged at just 2.7 c/kWh, mid-peak at 7.3 c/kWh, and on-peak at 9.3 c/kWh. All weekends and holidays are off-peak, with on-peak timings depending on the season. During the summer only 11.00am to 5.00pm is considered on-peak. The Ontario Energy Board (OEB) has some excellent resources online to help consumers better understand smart meters and Time-of-Use Pricing. At the time of writing (June 2008), smart metering in the UK is still a long way from being rolled out. 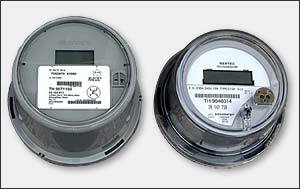 Some businesses already have smart meters, but virtually no domestic consumers have them as yet. The Government would like all 25 million homes in the UK to have smart meters within 10 years, but the utility companies must wait for a mandate from the Government before they can commence their roll-out plan. The costs of installing smart meters (for electricity and gas) in all UK homes are predicted at between £8bn (industry projection) and £14bn (Government estimate). Click here to view an excellent diagram showing exactly how smart meters are integrated into the electricity distribution system (498k JPEG file – 3225 x 1291 pixels). The same website (for Horizon Utilities) also offers these handy tips for shifting load – i.e. how to pay less for your electricity when using a smart meter.